Chronic obstructive pulmonary disease (COPD) can affect your day, in more ways than one, making it harder to get important tasks done. It can affect things as simple as cleaning your home, making it harder to clean can mean you may be living in an environment that can trigger a flare up as well. Living in an uncleanly environment can mean that you can get triggered by dust in your home. 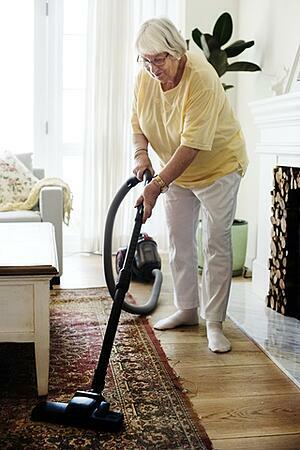 Though an uncleanly home makes it hard to relax and enjoy the day, it can be even harder to clean your home with COPD. Cleaning your home with COPD can be hard with the chemical fumes, as well as the strong scent added to the cleaning products. Chemical cleaning products can trigger a flare up, which can end up delaying your cleaning even more. It can be hard and scary to clean your home, as there is a high risk to trigger a flare up by either the scent of the cleaner or the dust you upset when cleaning. Harsh chemical cleaning products can trigger a flare up with your COPD, but you can always make your own cleaner. 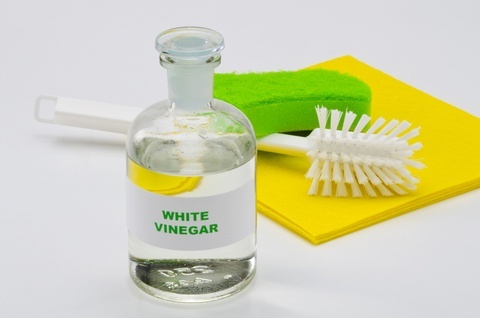 White vinegar is a classic ingredient in making a home cleaner that is not as dangerous as strong chemicals can be. Mixing equal parts hot water and vinegar is a great way to clean floors (especially the bathroom and kitchen) as well as counters. This mixture can also be used on mirrors, windows and any other glass in your home. If you need to clean tile grout in the bathroom or on the floor, use a mixture of ½ c. baking soda, ¼ c. water and ¼ c. white vinegar. Though it can be more cost efficient to make your own cleaner, you can also buy safer cleaners. Finding natural cleaner in store can be harder than expected, though it may say natural, there is a possibility that the ingredients can trigger a flare up for you. Proceed with caution when buying new cleaners, and throw out or return any cleaner that is an irritant to you. Avoid any bleach or ammonia based cleaning products as well as any product that has an ingredient you don’t know or cannot pronounce. The EPA also has labeled more “natural” cleaning products labeled as “Safer Choice” products, which can also trigger a flare up, so keep an eye out on the ingredients list anyways. Always avoid Febreze or Lysol, though it can bring a fresh scent to your home, it can make it worse for you. Though it may also be nice to light a candle or two at home, try to limit it to non-scented candles and only keep them lit for a short period of time. The smoke from the candles can trigger a flare up as well, even if it is unscented. 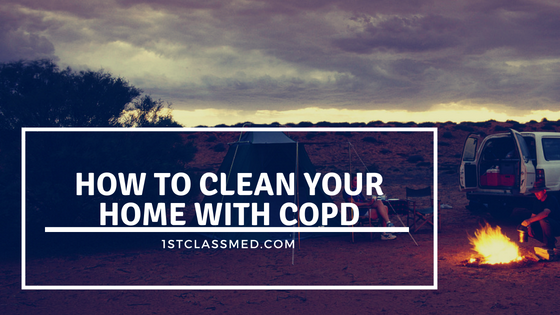 Knowing how to clean your home with COPD can make it easier on your body and lungs while cleaning. When cleaning your home, doing one room at a time can help minimize the risk of a flare up. Starting in the bedroom, wiping down surfaces first (normally a higher trigger for COPD patients) and working your way to vacuum can make it easier on your lungs. Doing one room at a time allows you to start with a high trigger and work your way down to something that may not bug you as much. Compared to cleaning the whole house with a high trigger (using chemicals to wipe down surfaces) and then vacuuming at the end of the cleaning day. The bathroom is the hardest room to clean, as your focus is to clean most of the surfaces with a strong cleaner to rid of all germs. For those with or without COPD, the best way to clean the bathroom is in steps. Starting by wiping down the counter, go and take a break or clean another room, going back to the bathroom when you feel comfortable. Moving to the toilet or bathtub/shower, clean that as best you can and take a break if you feel overwhelmed. By doing the bathroom in steps, you are never exposing yourself to chemicals or strong odors for a long period of time. You can also rotate your cleaning and do a small cleaning a few times a week versus a large whole house clean once a week. When cleaning your home, it can be easier on you to rotate what you clean, and clean multiple times a week. By rotating your cleaning, you clean everything without having to do it all in one day. Start with making a list of what you need to clean each week. By cleaning these every week, you limit the amount of germs you come in contact with, which can also help with your likelihood of getting sick. Like light switches and outlets, door knobs and handles need to be cleaned weekly in order to prevent possible illness. You may think these should not get gross, but over time they can. Try to clean them at least once a month. You never know how dusty these can get until to try and clean one after a few months. By cleaning them at least once a month, you are minimizing the allergens in your home. If you haven’t cleaned your curtains in a while, wear a mask when taking them down, or ask someone to help you. Vacuuming your couch can help minimize dust in your home, but it is something we don’t always think about. When you plop down onto the couch, you can release a lot of dust, try to clean it once a week. Garbage cans can be cleaned less, but if the smell of your garbage makes you have a flare up, try to clean it more often. Make sure to take out the garbage more often as well, especially after cleaning, to rid the garbage of dust and chemical fumes. Though it is not necessary to clean all of these every week, try to clean all of the a minimum of once a month. Ask for help if there are things you cannot clean on your own, i.e. taking the curtains down to wash or vacuuming the couch. Make sure to always clean the bathroom and kitchen every week, as both carry a lot of germs. Also try to focus on continuous cleaning for high traffic areas, cleaning them multiple times a week, which keeps the cleaning light and can make your home less uncleanly for your COPD. 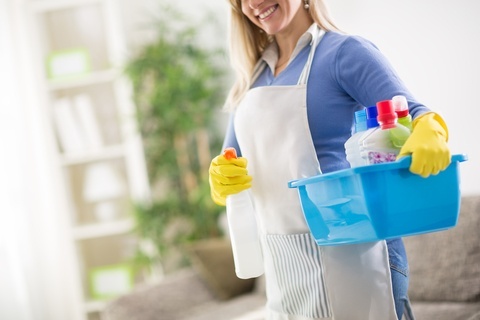 Though it can feel like an accomplishment to clean your own home, it can be beneficial to have someone clean for you. By having a family member help, or hiring a service to clean for you, you can save yourself the risk of having a flare up. Have family members use your cleaning products that are safe for you to be around and smell, or have the service use your products or products that will not trigger a flare up. Make sure if they do laundry as well, they use non-scented detergent and clean the lint trap when you are not home, or not around. When they vacuum, try to stay away from that area until it is done, as sometimes vacuums can pull up dust but not vacuum it into the bag. Make sure the vacuum bag is emptied by someone else, as there will be a lot of dust that flies up. As long as you can find someone to clean your home with products you have or that are safe for you to be around, hiring someone can make it easier on you. Make sure the individual respects your requests and follows your directions and then you can stop worrying about having to clean your home, or someone else cleaning your home. Though it seems like a lot of steps, the benefits outweigh the long process. By making your own cleaner you can make it easier on yourself to breathe while cleaning. Giving yourself small breaks, or even a full day in between cleaning can help keep the risk of a flare up at bay. It is also very important to focus on your breathing while cleaning, as the hard work and cleaner (either chemical or vinegar) smell can make it harder for you to breathe. If you struggle to clean on your own, asked a loved one for help or hire a service to clean for you or help with your cleaning. If your preference is to clean on your own, speak with your doctor about ways to make it easier on yourself. Always stop and relax if you feel overwhelmed while cleaning, or you catch yourself struggling to breathe.